The shortest and the tallest! 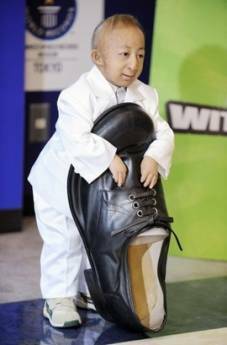 He’s 2 ft 5 inches tall and he’s holding the shoe of world’s tallest man ever, Robert Wadlow (1918-1940) who was a topping 8 ft. 11 inches! His own name is He Pingping and he suffers from a certain bone deformity. The picture was taken on 13th February, Friday (2009) at a program held in Tokyo to launch the 2009 edition of The Guinness Book of World Records. Here’s an interesting story about Pingping’s visit to New York city at NY Times Daily.